A DEAD RINGER FOR A DICTATOR? Tim Lasiuta on HONEY IN HIS MOUTH: "A lost treasure...remarkable." "[Dent’s] stories were fantastic and showed a talent for invention that has not been surpassed by any other writer." "The grand Old Pulp Pro...[Dent’s work is] fast, skillful, and happily unhackneyed." "The writers who hold their places in the lead of the adventure field are those who have taken the time to know their characters. 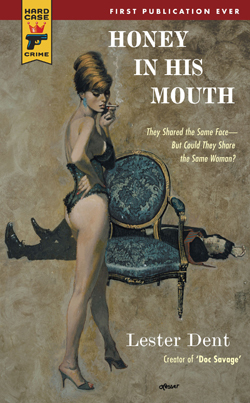 One of the most thoroughgoing character builders in the pulp field is Lester Dent."